Why should I have my alarm system monitored ? I am often asked this question by customers considering whether or not they should skip the monitoring of their alarm system to save the monthly costs. They ask "Aren't the decals enough - after all, the kids don't know it's not monitored ?" Before I answer that, let me first tell you that in this business, virtually the only money made by security companies is in the month to month revenue stream resulting from monitored accounts. As a result, the large mass marketers have targeted the winning of new monitored accounts to the exclusion of all else. All dealers make money from monitoring (some much more than others) but having said that, it also is a truth that monitoring is an integral and vital part of your security system. The primary purpose of an alarm system is response, not noise !! Your security system is comprised of four parts, and like all things in security is only as good as the weakest link. If any should fail or disappear, your overall system security has been seriously jeopardized!! Should you choose not to monitor your system, you are betting your home and possessions that the decals alone will fool thieves, and the horn will chase them away (all for the sake of saving a few dollars per month !!!) It doesn't very often work that way, in spite of what you might wish to think !! To rely solely on an audible alarm is to be overly optimistic. Its much like throwing a drowning man a life preserver without a rope attached !! Neighbours within earshot must be home when the alarm occurs, they must be awake, or involved in a pastime quiet enough for the audible signal to be heard. Neighbours must recognize the sound for what it is; they then must decide to take some action, rather than assuming it is a malfunction and choosing to ignore it. Neighbours must be able to easily determine where the noise is coming from, and then make a decision to take the initiative and call the police. Let me be very straightforward on this issue. Neighbours don't watch your home 24 hours a day. While neighbours invariably mean well, the simple truth is that they are often busy with their own problems and concerns. In these days of two-income families and "empty nests', it is not uncommon for suburban streets to be almost completely unoccupied for long stretches of time, and generally so during the 10:00 AM to 3:00 Pm high risk time of day. In addition, to ask your neighbours to risk their safety to investigate a possible break-in is not really fair to them, and generally should be avoided. Police living in your immediate neighbourhood have NO affect on the burglary rate on your street - they are victimized as often as anyone else. Internal or external horns are rarely heard in the dead of winter with windows closed and the TV blaring. There is a reason why insurance companies don't extend discounts to non-monitored systems. Their experience shows that local systems do not cut down the losses as a result of a fire or break-in, to anywhere near the degree achieved when a system is professionally monitored. Rural customers often think that their remoteness makes police or third party response less effective due to the response time involved, when in fact, these are the people who may need it the most !! In remote areas, thieves feel they can take the time to really clean out the home! People running small business ventures out of their homes have additional needs to protect their computer and business equipment from theft. Monitoring fees in these cases are generally tax deductable, depending upon your situation. If you don't want or can't afford the monthly costs to have your system professionally monitored, then don't spend the money to purchase a professional alarm system. 1- A ULC rated monitoring station which guarantees a certain level of personnel training and adherence to strict standards. 3- A contract with no long term commitment (month over month is much preferred), but certainly no longer than a year term, and a long term rate guarantee against a price rise. 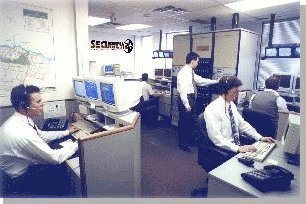 4- The assurance your alarm system is not "proprietary" in nature and can be monitored by any other station in the future. 5- Written assurance your board will NOT be locked in software( which normally necessitates a complete changeover of the expensive alarm board ) to prevent you from easily changing companies should their service or rates not be satisfactory. Remember, the staff responding to your alarm are highly trained individuals with experience in what to do according to the situation they encounter. Their service to you can be worth every penny you pay for monitoring services in an emergency! Just like insurance, you may resent paying for it up front, until you have a disaster, and then it seems inexpensive at 100 times the price !!!!! Monthly term only - no long term contractual commitment necessary. This page last updated Friday, May 15, 2009 .